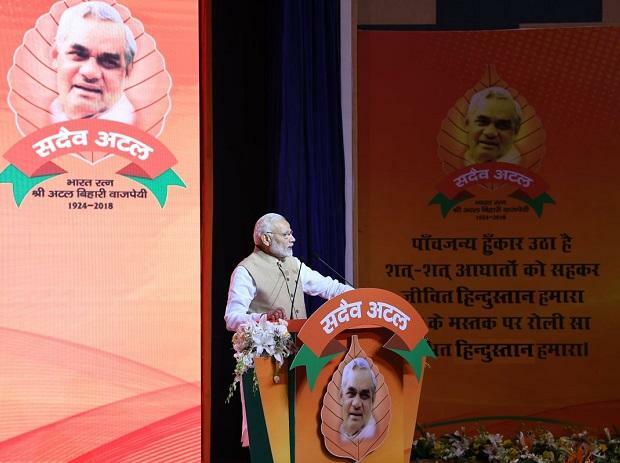 Setting the tone for the 2019 parliamentary election, Prime Minister Narendra Modi coined Sunday a new slogan, 'Ajay Bharat, Atal BJP', highlighting his party's commitment to its core values and the country's progress and forward march under its rule. The new slogan, 'Ajay Bharat, Atal BJP', means an India which is victorious and cannot be subjugated by anyone and a party which is committed to its principles, Union Minister Ravi Shankar Prasad said briefing the media about Modi's speech in the closed-door meeting. Taking a dig at efforts by opposition parties to stitch together a grand alliance against the BJP, Modi said, "People who do not see eye to eye are thinking of a grand alliance. It is vindication of our work." Describing his vision for the country, the prime minister said, "I want the country to be affluent, but its bedrock should be simplicity.